The Parish of Foveran dates back at least to the Reformation and there is evidence of Christian worship in the area from much earlier times; the present disused church of Foveran was built in 1794 on the site of a pre-existing parish church. On the instruction of Gordon Presbytery, Foveran Church is now closed with the intention that it be sold and, apart from occasional funeral services there, worship now takes place in Holyrood Chapel. Holyrood Chapel† was built in 1838 as the original Newburgh Mathers School and was bought by Foveran Parish Church in 1882 when the interior was converted to become a chapel of ease*. 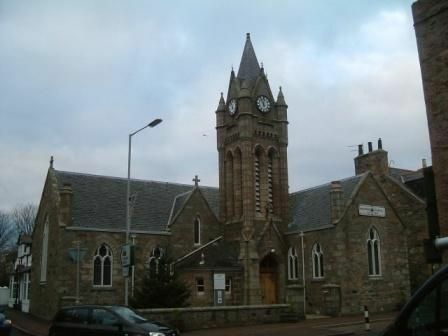 The clock tower was added in 1892 and the interior refurbished in 1907 to include the present pitch pine roof which is an imitation of St. Laurence Church, Forres.Holyrood was at that time used for evening services, the morning ones being held in Foveran church. Holyrood Chapel was named in honour of the original mediaeval chapel of the Holy Rood and St. Thomas the Martyr in Inch Road, Newburgh.